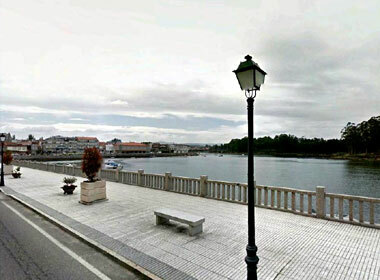 Arcing around the southern swathe of the ria de Arousa and heading towards the open sea and the outcrop of land known as O Grove, Vilanova de Arousa is the next town after Vilagarcia de Arousa. 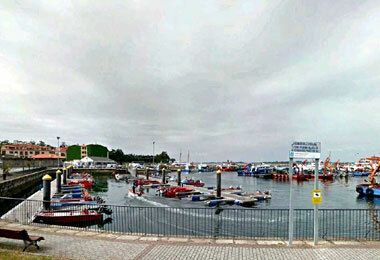 Vilanova de Arousa is a far more attractive town than its similarly named neighbour and as you drive through it you realise that the north of the town is comprised primarily of small hotels and restaurants, all within a whisker of the little beaches that line the coast. It has an up market feel, but in an informal way and the beaches, whist small and with a coarse yellow sand, look very appealing. 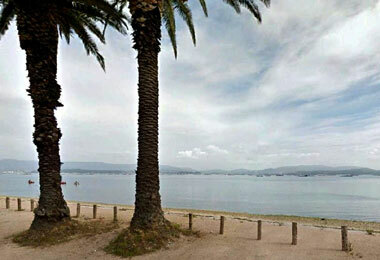 This part of the Arousa bay is also very picturesque and you get views looking out to the more open ocean as well as in to the estuary mouth and across to Vilagarcia. As you get to the southern end of this town you run into the older and more original parts and there is a small but pleasant semi-medieval area with a couple of plazas and a number of small bars. Two small churches are also located in this district, as is the home of a Galicia author which has a small tourist office connected to it. (As ever the tourist office was closed during our early afternoon visit.) There is also a bust of the author and a plaque (in Spanish) commemorating him. Left, a view of the beach as you enter the town from the north. 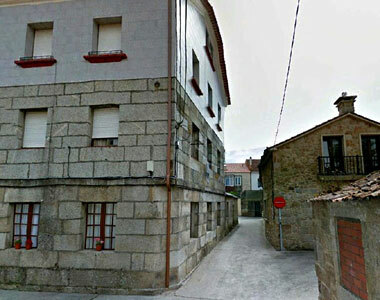 This old part of Vilanova de Arousa is undoubtedly worth stopping to look at if you drive down this stretch of the coast and an elevated horreo (granite grain store) and a couple of galeria featuring stone houses add to the ambience of the old district. Right, part of the old town. There is a nice bar to the right and beyond the old stone building. We were in need of refreshment whist in Vilanova and ordered some drinks and tapas at one of the bars in the old area of town. What we got was a veritable feast. A small plate of complementary tapas was served with the drinks following which we had four raciones (ration sized portions) of different tapas and all for a mere 10.6 Euros. Undoubtedly one of the best value and most authentic tapas style meals we have experienced in Galicia. Left, the promenade runing along the side of the ria.